See terms and conditions for THANKYOU below. 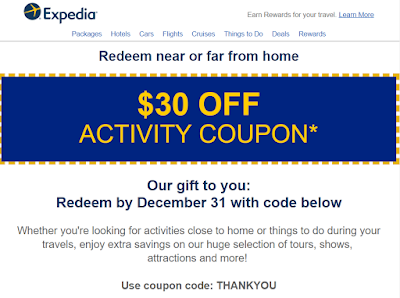 Qualifying Bookings: This coupon code discount applies only to activity bookings made online at www.expedia.com that are prepaid at the time of booking (subject to the restrictions set out in the terms and conditions below). Coupon code value: $30 USD off. Minimum Spend: $40 USD (minimum spend is the price of the activity reservation excluding any taxes, fees or additional costs). This spend must take place in one transaction. Travel Period: The travel dates must be between December 1, 2018 and December 31, 2018 (inclusive). During the booking process, on the payment page you will see the link ”Enter coupon code” where you can enter the coupon code.